For those of you that look for news about Blender 3d 2.50 developments, something new was added to the SVN and will probably be included on the next test release. Well, the tool is not entirely new, because it was available as a Python script in past Blender releases, and I had talked about this script and the application for architectural modeling.  Iâ€™m talking about the Solidify selection script, which is now a modifier since the rev 25487. 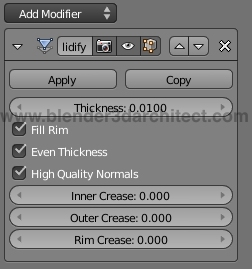 If you want to test this new modifier, just visit graphicall.org and download any test build of Blender 2.50 with a revision number bigger than 25487. What can we do with this modifier? 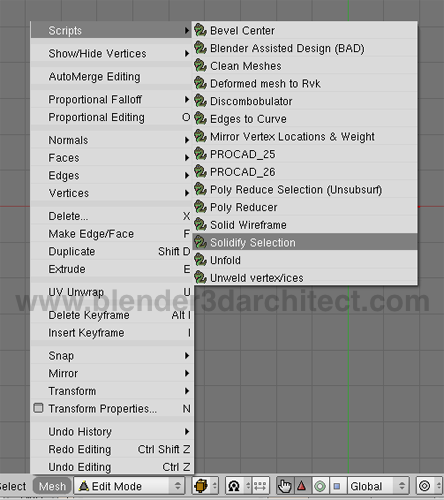 If you donâ€™t remember, with this tool we can select a plane or series of planes and create an extrude in all the objects at once, respecting the directions of the face normals. With the script we could work only in faces and at the end add a Solidify selection to turn a flat surface into something with a volume. The downside of using a tool like this as a script, is that we can only apply the solidify selection once and after the script ends, itâ€™s very difficult to go back and change the settings. If you close the file, it will turn into a regular Mesh object and all properties added by the script will only be editable by Mesh editing tools. 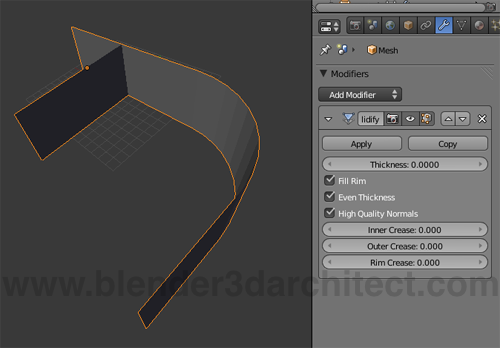 Here is an example of the application of the modifier in 3d model representing simple walls. To make this example work, we must align all face normals pointing in the same direction. 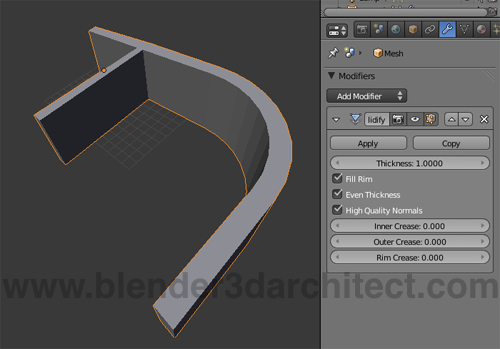 I donâ€™t have to say that with this tool added to the modifiers of Blender 3D 2.50, the process of working with architectural modeling will be a lot easier, especially for projects that change the layout of the walls a lot. We can create the layout of the walls and work in real time with extrudes to create the full set of walls. If the planes arenâ€™t in the way we want, just remove the modifier and start over. WHOA! This is so awesome! I’ve been waiting for something like this! 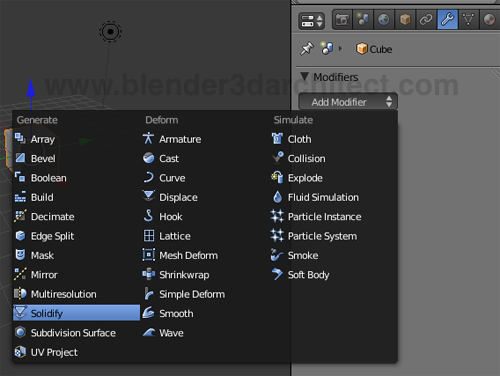 Will it be possible to apply the modifier to only a part of the mesh, like solidify ‘selection’? Maybe it will make this less useful! This is a very useful modifier. However, I should very much like to know what the three “crease” settings do. I have altered the crease settings on various models but without any visible effect. How long did we wait for this feature? We can use this with the explode modifier, canÂ´t we :)? Is there a build anywhere? I’m imagining this in tandom with the Decimate modifier! /cheer. It’ll be a beautiful thing. it is not solid at all, it has an empty core. Can anyone please help ? I really need to have a true solid wall. I don’t want to use Blender package from graphicall. I want to add this modifier into Official Blender package from Blender.Org.